Absolute Steel home kits include the exterior frame system and a complete exterior panel and trim package for the model and size you select. From there you can select a floor plan we have designed or design your own. For several models we can supply you with a complete breakdown of the various interior components that are available at your local building supply store. Just furnish that list to them for current pricing and you should know the bulk of your out of pocket costs to build out the interior of that kit home. A classic home kit design. Vertically-oriented exterior wall and roof panels. Superior runoff for rain and snow. View our Sierra kit floor plans. Horizontal panels give the appearance of wood shiplap siding. These panels and the Teton’s larger eave overhang give it an especially traditional, homey look. Easier to erect than other styles. Saves time and effort for if you’re a do-it-yourselfer, and can reduce labor charges if you’ve hired a contractor. 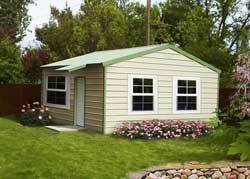 See our Teton kit floor plans. Best suited for areas with deep winter snows. Steep roof lines shed snow easily. This style is suggested if you are building in the high country, or heavy-snow regions. Extra storage space up above the living areas on some floor plans. See our Mohave kit floor plans. Featuring the traditional Gambrel style signature roof design. 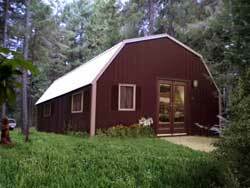 The Gambrel design, also called Dutch hip or Dutch gambrel – makes for an ideal cabin. The steeply sloping roof sheds snow with ease. The extra space gained by the steep roof makes for a great loft or storage area. See our Gambrel kit floor plans. The steel frame. Your kit is shipped in a manageable bundle that can fit on a small trailer, or in the bed of a larger pick up truck. Your kit home’s finished shell can be put together by as few as two people, with little or no prior construction experience and using common tools! This means YOU can do it, whether you build yourself or act as an owner/builder using local tradesmen and contractors. At the heart of Absolute Steel’s home and guest house kits is our internationally-known steel frame system. All steel used in Absolute Steel kit homes and guest house kits must meet certain engineering specifications for alloy content, strength and durability. Rest assured that the steel we use comes from reputable companies. We also insist upon Material Test Sheets that verify the purity of the metal for our steel frame houses. You may be able to find steel at lower prices, sourced from unreliable vendors, but with such metal you have no solid guarantee of what you’re really getting. As an example, the steel in our roof peaks is rated at a yield strength of 65,000 ksi. That means the steel will withstand a pressure of more than 130,000 pounds per square inch before yielding. That’s the lowest rating we’ll accept. It can be a bit more expensive to do that at times, but we are talking about people’s lives and property. You know that a building’s base is one of its most critical components. The strength and security of the entire structure rests on that base – literally. 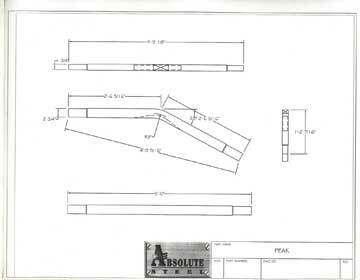 Absolute Steel uses a unique insert system in all base rail components for its kit homes and guest houses. 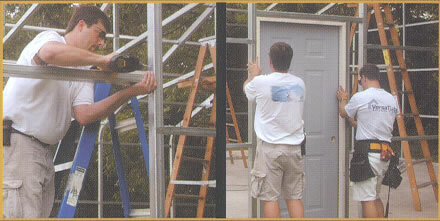 This makes it an easier system to erect—using our insert system, two people can assemble walls and roof frames with ease. At the base of your building, where water or condensation can collect, you have thick, unstressed and uniform connections. This ensures the prevention of rust and corrosion to form where it would do the most damage. You’ll always have a consistent fit. Never a need for a sledgehammer to pound parts together, just because someone’s bending machinery was out of adjustment. Moving up from the base rails, our frame system offers yet another advantage. Similar to the base rails, most manufacturers crush, bend or roll components to connect base rails and sidewalls. At Absolute Steel, rather than damaging the metal, we once again use an insert system to form solid connections. This even makes it easier to make small adjustments in sidewall height, with no loss of strength or stability. This is the same steel building system we’ve manufactured and sold for years—it goes together as easily as you can slip two pieces of steel together. We call it Slip Joint Connections. Slip-Joint Connections make assembly easy. Always a smoother, stronger connection. If you’ve been wondering how to build your own house or guest house, here is your answer. A do-it-yourself dream. Even if you don’t plan on doing it yourself, you still win – your contractor will be able to complete the job fast. Your steel house package includes illustrated, step-by-step instructions – easy to follow and calling for only a few basic tools. Our buildings have been assembled by husband and wife teams (yes, they’re still married) without a problem. If you’re handy with basic tools, you’re qualified! The pictures below show a condensed version of the home kit assembly steps. Even a dedicated do-it-yourselfer may not think it’s wise to tackle some of the specialized jobs involved in putting up a complete home or guest house. Maybe you’re not quite comfortable with electrical work, or up to date on current plumbing regulations. Or maybe you just plain don’t like to work with drywall. There’s a simple answer for cases like that: There’s a simple answer for cases like that: an owner / builder. As owner/builder, you do some of the work yourself, and hire contractors to do other parts of the job. It amounts to acting as your own general contractor, and for many people, it’s the perfect way to go. If you need help deciding which way to go, call one of our kit homes representatives at (888) 658-5147 and ask them to send you a complete set of installation instructions. Choosing a good contractor is one of your most important steps as a kit home or guest house owner. If you’ve decided the do-it-yourself route isn’t for you, here are some guidelines to selecting someone who will do a professional job at a fair price. Your most important job in contractor selection amounts to a “reality check” into any contractor you’re considering. There are a few fairly simple ways to go about this. First, you can check into the contractor’s past jobs. Go have a look in person, or call the owners or residents. These days it’s pretty easy to go to your local licensing agency (usually a state agency) to find out if there are any outstanding or unresolved complaints filed against a contractor. Consulting the Better Business Bureau (http://www.bbb.org/) is also a good practice. Here you can find out whether a contractor has been accredited by the BBB, and learn about the company’s reputation with past clients.  In many areas there are also websites that offer ratings and reviews of local businesses. These can be found by searching for “business reviews _(your city or area)_” using Google, Yahoo or other search sites. It’s smart to get written estimates from several different contractors before settling on one to build your building kit. Automatically hiring the lowest bidder isn’t always the best bet. Instead, compare estimates closely. Ask low bidders why their bids are different from others. They may very well be offering you a great value – but they may have omitted parts of the job, mistakenly or otherwise. Some contractors have been known to do this, only to bring them up later as expensive “add-ons,” once the job is under way. Meeting with and interviewing any contractor you’re seriously considering is another excellent idea. Here are some important questions to ask. While most states license electrical and plumbing contractors, only 36 states have some type of licensing and registration statutes affecting contractors, remodelers, and/or specialty contractors. The licensing can range from simple registration to a detailed qualification process. Also, the licensing requirements in one locality may be different from the requirements in the rest of the state. Check with your local building department about licensing requirements in your area. If your state has licensing laws, ask to see the contractor’s license. Make sure it’s current. The contractor should be able to give you the names, addresses, and phone numbers of at least three clients whose projects were similar to yours. Ask each how long ago the project was completed, and if you can see it. 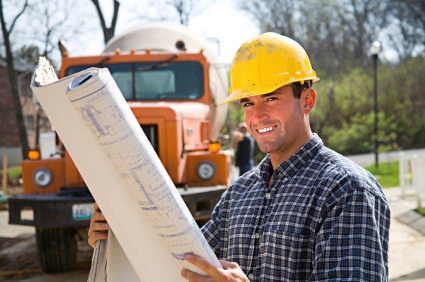 Contractors should have personal liability, worker’s compensation, and property damage coverage. Ask for copies of insurance certificates, and make sure they’re current. Avoid doing business with contractors who don’t carry the appropriate insurance. Otherwise, you’ll be held liable for any injuries and damages that occur during the project. How did the contractor handle any problems that came up? A detailed list of all materials including color, model, size, brand name, and product that you will be turning over to the contractor, for use on the job. Warranties covering materials and workmanship. The names and addresses of the parties honoring the warranties — contractor, distributor or manufacturer — must be identified. The length of the warranty period and any limitations should also be spelled out. You have inspected and approved the completed work—sometimes done in phases. Any inspections by local building inspectors have been completed and passed. This may mean more than one inspection, by two or more different inspectors. For example, in some areas there are different inspectors and inspections for a building’s foundation, its plumbing, its electrical work, structural work, etc. Once your new house is complete, you can be a big help to others who are hunting for a contractor. Go back to the Better Business Bureau’s site and leave a review of your experience. Do the same with other ratings-and-reviews-sites. Whether your review is positive, negative, or mixed, what you have to say is sure to help someone else find the right contractor. If your contractor has done a great job, your review could also help send more business his way – probably the best bonus you could give. A kit home or guest house is a residential structure, constructed from a packaged set of ready-made, pre-measured parts. A home or guest house kit from Absolute Steel gives you everything you’ll need to assemble your new house’s basic structure. Plans, framing, siding, roofing – all the pieces and parts, ready for rapid, easy assembly. And by “easy,” we mean the job can often be done by as few as two people, with little or no prior construction experience and using common tools. How expensive is a kit home or guest house? Kit houses from Absolute Steel range in price from ____ to a bit more than ___, depending on style, size and floor plan. Costs for finishing the home are comparable to what you’d pay for more traditional home construction. Your big savings are in the house’s frame, siding and roofing – and in the ease and speed of construction. Over the years you’ll save big on maintenance costs, too. Your steel-strong frame, siding and roofing can far outlast other home kit material options. Who is a kit home or guest house for? While kit houses are ideal for the do-it-yourselfer, they’re also gaining popularity all over: young people buying their first home; older folks who want a comfortable, economical, low-upkeep home for their retirement years; families needing additional living space for guests or relatives – the list goes on and on. In short, people are catching on to a kit house’s many advantages. In fact, anyone looking for economically-priced, solid and sensible housing solution would do well to consider a kit home or guest house kit. What’s included in a home kit? First, your home or guest house kit includes the complete steel exterior frame, all siding and roofing panels, all trim and fasteners. Everything needed to erect the basic structure, and anchor it to its foundation. If purchased, all necessary engineering calculations and specifications are there too, signed and sealed by a licensed engineer in your State. What is not included in a home or guest house kit? Your kit does not include building materials for your foundation, interior walls, wiring, plumbing and other elements. Where can a kit house be shipped? We can ship your kit home or guest house almost anywhere in the world. Of course, we’re most experienced in shipping to locations in North America, where we’ve delivered thousands of building kits over the years. But you’ll also find our buildings in spots around the globe. Name the place, and we’ll work with you to make the arrangements. 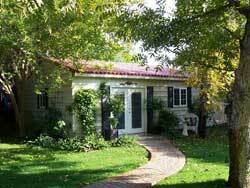 What types of kit homes and guest houses are available? 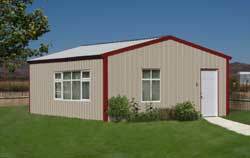 We offer kit houses in four different styles. There are four different floor plans available for each of those styles. What all these styles and floor plans have in common is their top-quality steel framing, siding and roofing, their complete, engineered plans for interior walls, wiring, plumbing and so on, and Absolute Steel’s commitment to quality and customer service. From those basics, there are no limits to the possibilities – you’re free to make your finished home or guest house as unique as you are. How long does it take to build a kit house? The basic “shell” of your house – exterior frame, siding and roof, all anchored to your foundation – can be completed in a matter of a few days. That’s been achieved many times over, by people with little or no construction experience, using common tools. How can that be? We’ve worked hard to make our assembly as easy as possible. We show you how with easy-to-follow instructions, and our staff are always happy to help you out, if you run into questions along the way. Can I get tax credit for building a kit home or guest house kit? 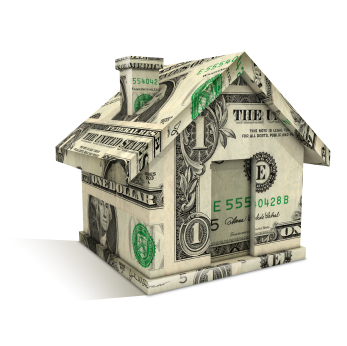 Tax credit on any new house is dependent on so many factors that we couldn’t give you a definite answer to that here. However, many of the roofing and siding panels you’ll have to choose from in selecting your kit home carry an Energy Star rating. Choosing such panels would be a significant step toward qualifying for tax credit. Can I really build a kit home or guest house myself? the answer is YES – you can build your own house with our easy-to-assemble building system. Our buildings have been assembled by all sorts of people, from a single mom and her young son, on up to skilled construction workers. Most often our buildings are erected on a concrete slab with a “footing” of thicker, reinforced concrete around the slab’s outer edges. Building codes vary from place to place, though, so you’ll need to check into your local requirements to find out exactly what’s needed in your area. What about waste water (sewage)? Consult your contractor or local building department for waste water handling requirements in your area (connection to municipal sewage system, septic tank, or other options). Local contractors will be familiar with what is needed, and with how to set you up most economically. Your home kit will not include plumbing parts and fixtures, though. It works out to be more economical for you to obtain plumbing supplies locally. Do I need a permit to put up a kit home or guest house? In some areas in the US, yes – you will need a building permit. 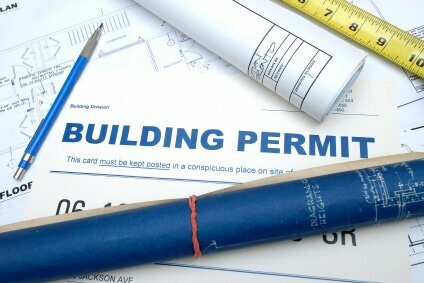 Consult your local building authority for the details of what’s needed to obtain a permit. We’ll work with you to ensure the plans we provide you will help you meet or exceed all requirements. We offer kit homes in 4 sizes: 400 square feet, 600 square feet, 900 square feet, and 1200 square feet. Each of our four kit home styles is available in all four sizes, and each size has its own basic floor plan. Can I customize my kit house? Yes, you can definitely customize your kit home or guest house kit. The exterior framing is standard in all our styles and sizes. The plans we provide are standardized for each style, size and floor plan. From there, there are endless opportunities to make your home distinctly, uniquely yours. 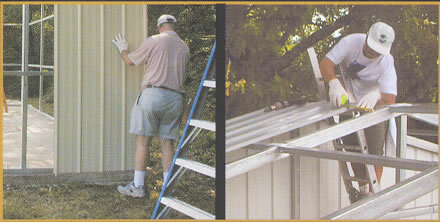 Our siding and roofing panels are available in a wide range of colors. Decorative faux stonework panels are also available in several styles and colors, to give your house’s exterior a distinctive look. And when it comes to your interior, the possibilities are huge – colors, textures, cabinets, counter tops, flooring, fixtures, lighting – it goes on and on. Can I have a customized floor plan? Our kit home and guest house floor plans are standardized for each style, but you definitely have the option of customizing your interior floor plan. Formal engineering drawings for a customized floor plan could be obtained through a local draftsman/engineer or architect of your choice. Can I have a fireplace in my kit home? Certainly. Though none of our floor plans includes a fireplace, a local builder’s supply store or contractor can show you how one can be added. There are kits available these days that can make installing a fireplace a fairly simple proposition. The home or guest house kit itself could be included in any overall financing package you might obtain from your local lender. When it comes to a primary or secondary home, you are best off dealing with your local lender or mortgage company—they know your area. Although we don’t recommend contractors, we’re happy to provide you with guidelines for finding one who can do the jobs you need competently and economically. Is there a warranty on kit homes and guest houses? The different materials we supply you for your kit house have their own warranties. Please see our Policies and Procedures section for further information on warranties covering the parts of your kit that we manufacture. What about insurance for my kit home or guest house? To find a homeowner’s insurance policy, a local insurance agent is your best bet. These days, you can often obtain special home coverage rates from the same company that insures your car. Our kit homes and guest house kits are offered in four different building styles, with four different floor plans available for each style. Will I be able to add on to my kit home or guest house later? Certainly. Additions could be as simple as putting up an adjoining storage building, or extending a patio cover out from your original house’s roof. More elaborate additions, such as new rooms, would require a bit more advanced design and planning, but any reputable local contractor could help you with these. What about a garage or carport? 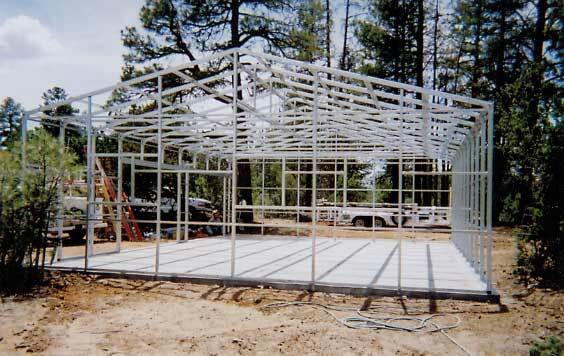 A garage or carport can definitely be added, and we build those as well. It’s a simple matter to add a separate garage building or carport, adjoining the main building. Attaching a garage or carport to your house’s structure is a bit more involved, so naturally the best time to make such plans is right at the beginning. Get in touch with us about this early, so we can help you make the right decisions. Does a kit home have an attic? Yes, each of our home kit and guest house styles includes attic space. The Gambrel and Alpine styles, with their steeper roof lines, offer the most upper-level space. Is roofing included in a home or guest house kit? Yes. Your kit includes a complete steel roof – now recognized as far superior to traditional roofing, and ready to keep your home secure for decades. It also includes all your home’s siding, with a number of material, color and design options available. Does a kit home or guest house have good investment value? Yes. Once your house is completed, you’ll have a beautiful living space, made to last. Its exterior framing is all top-grade steel. So are its roofing and siding. These features alone help hold its value better and far outlast other conventionally built houses. Will you install my kit home or guest house for me? We do not install kit houses, but we’re happy to offer you guidance in selecting a reliable kit home or guest house contractor in your area. Kit home or guest house inspection and permit requirements vary from location to location. Before you build, you’ll need to contact your local building authority to learn the specific requirements in your area. We’ll be happy to supply you with drawings, engineering calculations or other documentation needed. Can you ship my kit home or guest house kit outside the US? Yes, we can arrange to have your house kit delivered almost anywhere in the world. Complete engineered plans can be purchased for kit homes and guest homes. By “engineered plans” we mean detailed drawings of your house’s foundation, frame, siding, and door and window locations. In addition to your house’s “shell,” your plans will include framing details for your interior walls, electrical, plumbing, kitchen cabinets, ventilation, heating and cooling, and other details. Hiring someone to do these drawings could easily cost you $2500 or more. 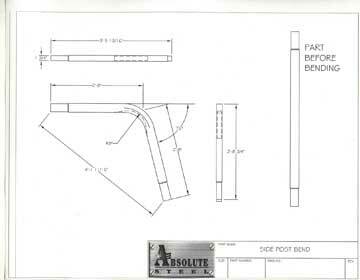 Since we’re able to do the work in advance, we can offer you complete, stamped drawings for less than $1000. It’s just another reason building a kit home is such a smart choice. It’s no surprise home and guest house kits are more and more popular every day. Kit homes and guest houses from Absolute Steel include complete engineered plans. By “engineered plans” we mean detailed drawings of your house’s foundation, frame, siding, roofing, interior floor plan, etc. All engineering calculations and details are included, and your set of drawings will be signed and sealed by an engineer certified for your state. Signed, sealed drawings of this type are ordinarily required by local building authorities before they will issue you a permit to build your home or guest house. Local zoning and building rules are also a concern. It is impossible for us to stay abreast of all the governing municipalities in this country, with their respective regulations, requirements, fees and so on. We’ll be happy to work with you to make sure all requirements are met, but please remember: Compliance with your local building codes is ultimately your responsibility. 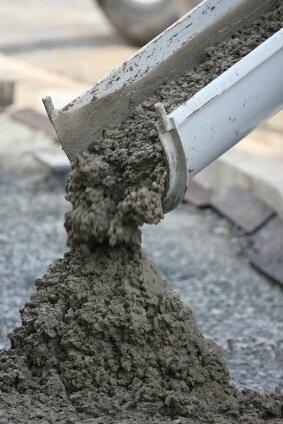 Note: Requirements for residential foundations vary from area to area. The engineered drawings provided with your cabin kit will include foundation specifications that meet or exceed your local requirements. Kit homes from Absolute Steel are designed to be anchored to a concrete foundation. This is accomplished with a concrete floor, combined with either footers or stand-alone concrete piers. 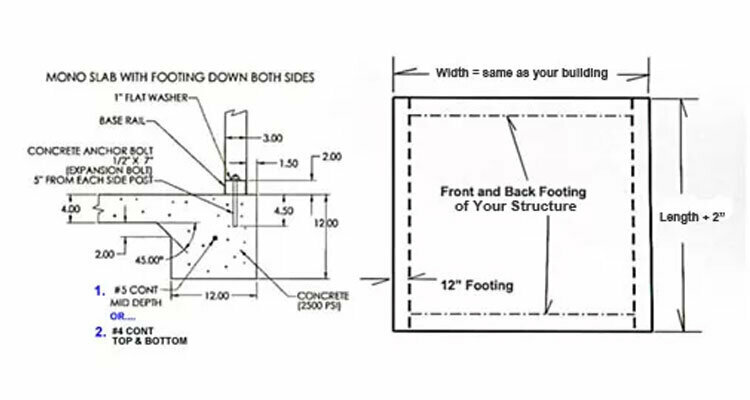 In most areas, a standard foundation for this class of building consists of a concrete slab at least 4″ thick, with a perimeter footing at least 12″ wide and 12″ deep. Conditions and requirements vary from area to area, though, so you might consider phoning us and speaking to one of our building consultants – they’ve dealt with this issue many times. If you’re doing the job yourself (or just in case you’re interested in some of the technical details) the pad should be 2500-psi concrete (minimum), with either #3 steel reinforcing bars set every 24”, or fiber mesh reinforcement added to the concrete mixture. Expansion joints should either be saw-cut within an appropriate time after the pour, or troweled in as part of the finishing process. The original and standard exterior of our kit houses is painted and multi-coated steel panels, just like the roofing we supply. In this case, though, “standard” surely doesn’t mean “boring.” Many of our steel panels are designed to give you a residential look, while still offering the maintenance-free qualities only steel can deliver. With more than 18 colors to choose from, you’ll have one fine-looking house. Select the combination of exterior wall, roof and trim colors that pleases you best. Steel will always be your most economical choice, your most maintenance-free choice, your most pest-resistant choice. And with today’s insulation, it can also be your most energy-efficient choice.